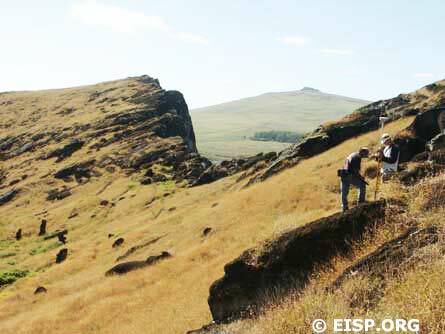 Cristián Arévalo Pakarati and Matthew Bates surveying in Rano Raraku quarry. ©EISP/JVT/Photo: Alice Hom. 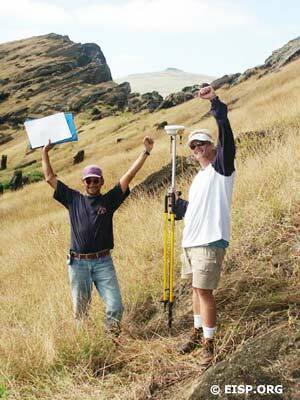 Cristián Arévalo Pakarati and Matthew Bates celebrate the last survey point. ©EISP/JVT/Photo: Alice Hom. In 2002, we surveyed to centimeter level accuracy using two Ashtec GPS single frequency satellite receivers to gain latitude, longitude and elevation above sea level. The attitude of the statues was also recorded: the direction in which the statue faced; the forward slope, and the sideways/lateral slope. In 2004, we used Trimble 5700 equipment. Our major field emphasis was the collection of additional mapping points that would allow the further exposition of design details on selected statues and quarries. The pace of work was approximately 300 survey points collected per day for a total of 2,200 points collected in Sections C and D.
A few interior quarry features in the Atlas were impossible to relocate without additional identifying information. On the exterior slopes, eight statues or possible statues shown in the Atlas and numbering RR-002-209, 215, 216, 226-228, and 231-232 were not relocated due to new rock falls or erosion of identifying features. In a few instances, we found that the orientations, head/base relationships or minor archaeological details (i.e. presence or absence of taheta) of several statues on both the interior and exterior were inaccurately indicated on the Atlas. These anomalies will be rectified on our forthcoming map and all available identification numbers assigned statues by previous investigators will be cross-referenced. A total of 139 statues, from shaped block to partial form to finished, fully detailed figure, were mapped in 19 discrete interior quarries—42 more than previously suggested. Quarry descriptive details constitute an additional, vast quantity of information, and include carving canals, transport canals, papa surfaces and configurations and tool marks. Important and previously unrecognized rock art on statues and in quarries was documented. These data will be integrated into a separate but parallel study of rock art iconography currently underway. None of the individual quarries are directly linked, but internally some of them show a degree of planning. Some quarries appear to have been practice or teaching areas for such important features as statue heads and faces. As Routledge noted, narrow carving canals, some very steep and dangerous, are cut into the bedrock alongside and at the top and bottom of roughed-out blocks. These average about 50 cm wide, and some are stepped. Carvers stood in these canals to work. 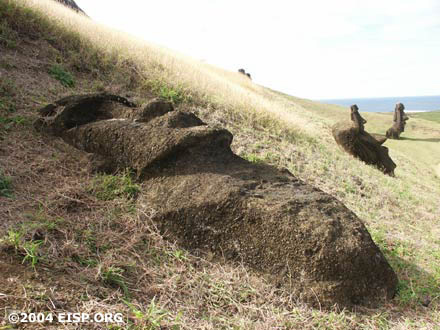 Moai on exterior slope, Rano Raraku Quarry. ©EISP/JVT/Photo: Alice Hom. Lichen found on the back of a moai.©EISP/JVT/Photo: Alice Hom. 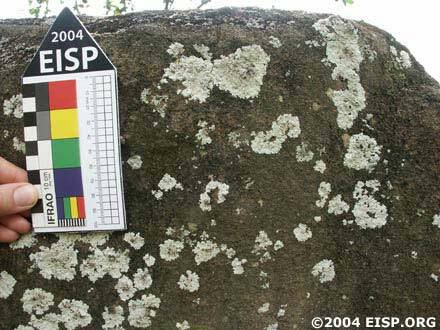 The value of the EISP database is that it supports reconstruction of the prehistoric Rapa Nui human population as a component of ecological, political, and esoteric systems. It combines analytical tools with social theory to contribute a unique perspective on island change. Its use facilitates the semiotic analysis of prehistoric Polynesian spatial organization. 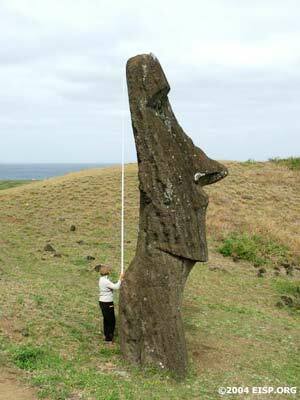 It is complementary to other ecological, geographic, economic, and social analyses in Pacific Studies, and integrates Rapa Nui into the larger and better understood East Polynesian interaction sphere. Finally, it provides insight into the long-term development of human systems, allowing visualization of historical and ecological linkages of the past with the present and future. 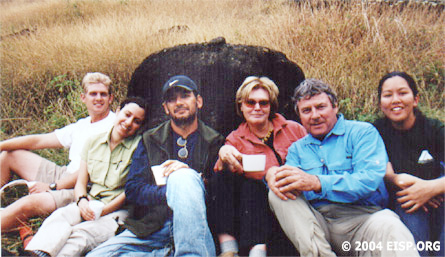 In 2004, our condition reporting system was reviewed by members of the Getty Conservation Center staff. As a base-line inventory with time depth, it was deemed a useful tool for conservators; however, some categories of data were revised, redefined, or renamed. These new-format statue condition reports were then completed by 2004 team members for every statue documented in the interior slopes and quarries, and for those standing or fallen on the exterior.